Before 1990, the name of Hamas’s military wing was unknown. 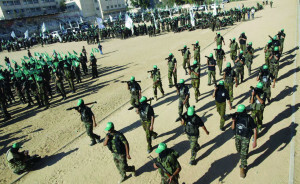 That year, however, witnessed a quantum leap in the military performance of the movement, which founded its own military force, the “Ezzedine Al-Qassam Brigades”, named after the martyred Syrian resistance fighter who was shot dead by British soldiers in the Palestinian town of Ya’bad near Jenin in 1935. The founding leaders of Al-Qassam Brigades say that military activities of the Muslim Brotherhood, prior to the establishment of Hamas, started in the 1980s under different names, including “Palestinian Mujahedeen” and “Majd”. In January 1, 1992, the brigades issued their first statement and circulated it following an operation carried out by one of the movement’s cells, which killed the rabbi of Kfar Dorom settlement, Doron Shoshan. In the statement, Hamas introduced Al-Qassam Brigades officially as its military wing. The military wing started its operations with a pistol, then a rifle and then manufactured its own machine gun. Its weapons evolved to include improvised explosive devices such as “Hoaz” explosives, and then suicide bombings using explosive belts, in addition to bombs and remote-detonation equipment. The Sderot settlement was the first target of the locally-produced Palestinian rocket launched by Al-Qassam on Friday 26 October, 2001. The rocket was named “Qassam 1” and was described by Time Magazine as “the primitive rocket that may transform the Middle East.” It was developed rapidly into “Qassam 2”, which debuted in February 2002. The resistance group has expanded the range of its rockets to over 80 kilometres. The M75 was used in Israel’s war against Gaza in 2012; Israel’s latest assault and invasion of Gaza this month has seen the R160 rocket used in retaliation, aimed at Haifa. In a remarkable development, Al-Qassam announced on 14 July its ability to manufacture 3 drones for use in special operations against Israel. Like other armed forces around the world, Al-Qassam has specialist units for engineering, aerial operations, artillery and martyrs. During the current Israeli operation in Gaza, the brigades have announced the first operation by marine commandos, who infiltrated Israel’s heavily-fortified Zakim military base located in the city of Ashkelon. Al-Qassam Brigades have employed deterrent technology to confront the Israeli armed forces. The military wing has claimed that it has produced anti-tank missiles, such as “Al-Battar” and “Al-Yassin”, and improvised explosive devices which have shattered the myth of the invincibility of Israel’s Merkava tanks. The brigades fought in Israel’s two wars of aggression against the Gaza Strip in 2008 and 2012, and claim to have inflicted heavy losses on the Israelis.